Since 1950 Jamaica Inn has consistently been ranked as one of the top luxury Caribbean resort hotel and vacation destinations. Virtual tour copyright Jamaica Inn. Jamaica Inn's crowning glory is its accommodations -- spacious, impeccable and very tasteful. Beds are always freshly made, even after an afternoon nap. There are no TVs, Radios or Clocks to intrude between guest and rest. The cool sea breeze filters through louvered shutters. For the occasional lull, ceiling fans and air conditioning provide comfort. Each suite has a private balustraded balcony or large verandah overlooking the water. Balconies and verandahs come complete with a full sized sofa, wing chair, breakfast table, writing desk and coffee table. The property's suites are equipped with air-conditioning, ceiling fans, hairdryers, mini fridges (stocked on request), robes, your choice of king or twin beds and complimentary wireless internet access. KiYara honours the sanctity of Nature and celebrates it, in this natural ocean-front setting. Our philosophy is, "In Balance, with Nature" and our treatments are drawn from the plants of the island, which are sourced both from local organic farmers and wild-gathered, by environmentally - sustainable methods. We know that good health and well-being are a reflection of balance within, as well as without. We believe that lasting Beauty radiates from a tranquil spirit. Our goal is to create the space for all who enter our gates to discover their own state of balance. With great joy, we dedicate this Spa to sharing the Universal Spirit of Balance and Wholeness. During the day, the most popular spot at Jamaica Inn is it's 700 foot beach that is covered with champagne colored soft sand. 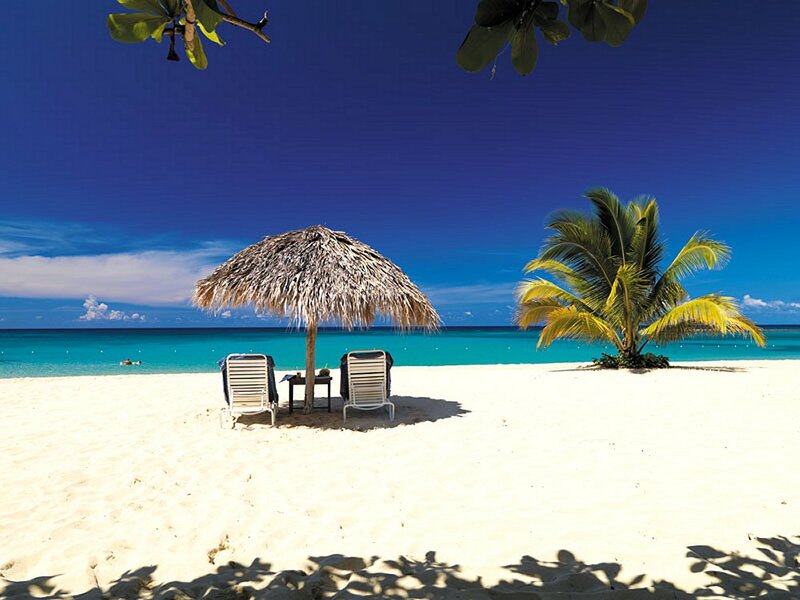 Often ranked as one of the best in the Caribbean, Jamaica Inn's beach is one to experience. Relax in your lounge chair under your very own palapa and enjoy the serenity of this uncrowded gem. Have lunch delivered to you right there on the beach with no additional charge for delivery. Enjoy a choice of one complimentary Planters Punch or Blended Fruit Punch which is served to each guest on the beach daily (between 11:00am - 12:00pm). Our bar staff is patrolling the beach all day to ensure that nobody is thirsty. Gourmet Magazine July 2003 - Named Jamaica Inn as its pick for a Romantic Dinner in Jamaica. "Listen to the surf whisper against the sand, and gaze at the night sky through a lattice of palm fronds on the dining terrace at Jamaica Inn." "Dinner is again a pleasure, eagerly awaited, with a choice of international cuisine with a Caribbean twist, served with style and flair. Fresh flowers are always present." Jamaica Inn is a small, elegantly timeless, resort located in the beautiful Ocho Rios, Jamaica. Situated on what many consider to be the premier private beach in Jamaica. All of Jamaica Inn's 47 suites overlook the beach, the blue Caribbean sea or both.